So the whole neighborhood has gone on vacation. There is no-one to play with or talk to. Except me. Cos Dad's working through the weekend. Plus, it's been a rather gloomy day with sprinkles every now and then. What does an 8 year old do? These were easy to make and a great hit! Cut the crust off each slice. Flatten each slice of bread by with a rolling pin. Spread green chutney on one side of a flattened slice. 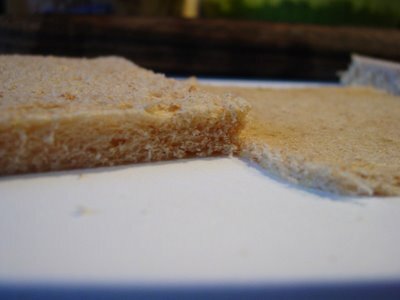 Cover this with the other flattened slice and spread ketchup on the one on top. (Or spicy red garlic chutney for the adults). 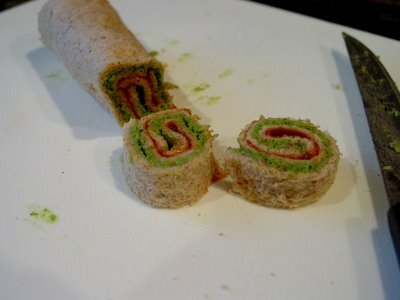 Roll it up carefully, pretty much like you would roll up a sponge cake for a Swiss Roll. Slice each roll into 8 pinwheels. The pinwheels disappeared almost instantly. The boondi was quickly smothered in yogurt for an impromptu boondi raita that was consumed with relish. The glowing suncatchers are out of the oven and we are waiting for them to cool before we hang them on Medha's window. Shankari, I do pretty much the same thing. Except that I soak the dried red chillies in warm water for a couple of hours, and grind them with garlic and salt to taste. No oil. It lasts for a couple of weeks in the refrigerator. I use it on bhel, sev-batata-puri, and dahi-batata-puri. I also use it in my meat curries. 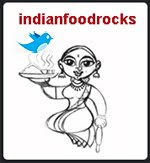 Hi Manisha:) Sree here,can you mail me at the id on my blog? Wow!thanks a lot for this,looks so good and colourful! Manisha, Came to your blog thru Vaishali's. Liked your recipes very much. 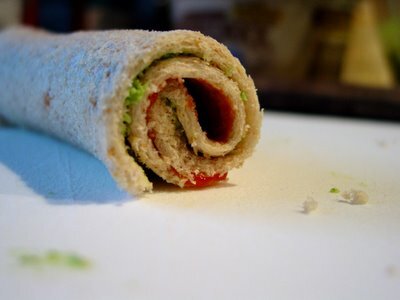 Your pinwheel sanwiches reminded me of school days when we had made them in school once. Perhaps you will like the latest bread recipe I have posted on my blog too. Great appetizer! definitely a crowd pleaser..
Manisha, any combination of red/orange, white, green looks like an Indian flag to me (espicially in the month of August) :). 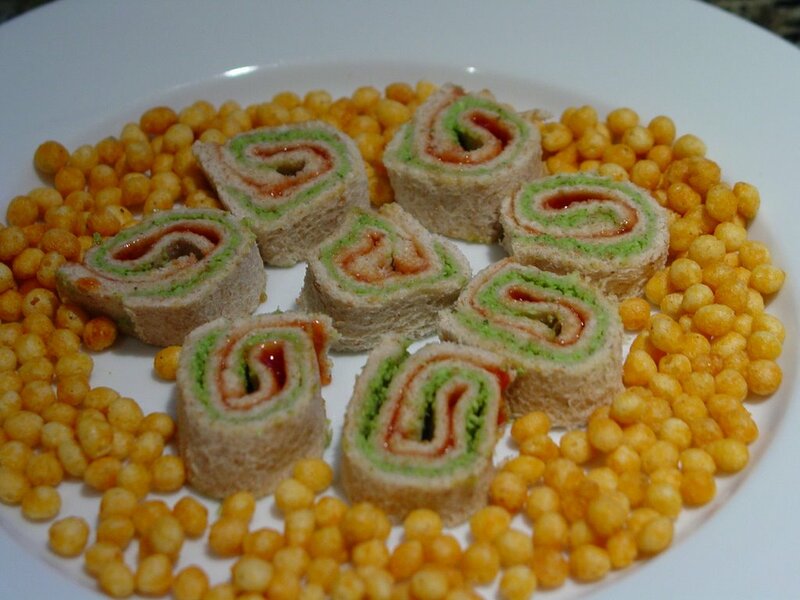 Your Pinwheel snack looks great. BTW..when I first heard of baking 'suncatchers', I thought 'suncatchers' must be a kind of seafish :(. I think I have a lot to learn. By reading your blog regularly, I think I will be able to learn a lot more than just recipes :). The pinwheels looks lovely, but the sun-catchers are simply stunning! :) Post a recipe for those too please? Just saw the toothfairy note and wanted to pinch her cheeks if I could! Sree! Welcome! An email will be winging its way to you shortly! To those who don't know Sree, please check out Sree's Canvas - A Garden of Hues to be enthralled by sketches and paintings by a very talented young woman! Sumi, my daughter loved the colors, too! It's a keeper, according to me! with any leftover bhaji as well, right? KA, thus far I have tried it only on my family. My next set of guinea pigs are usually my neighbors. They are American but the kids eat spicier foods than my Medha. And they loved my karela! Shilpa, that is so true! I had the same thought when I was making them! Except that I use brown bread. I can see why you were confused! 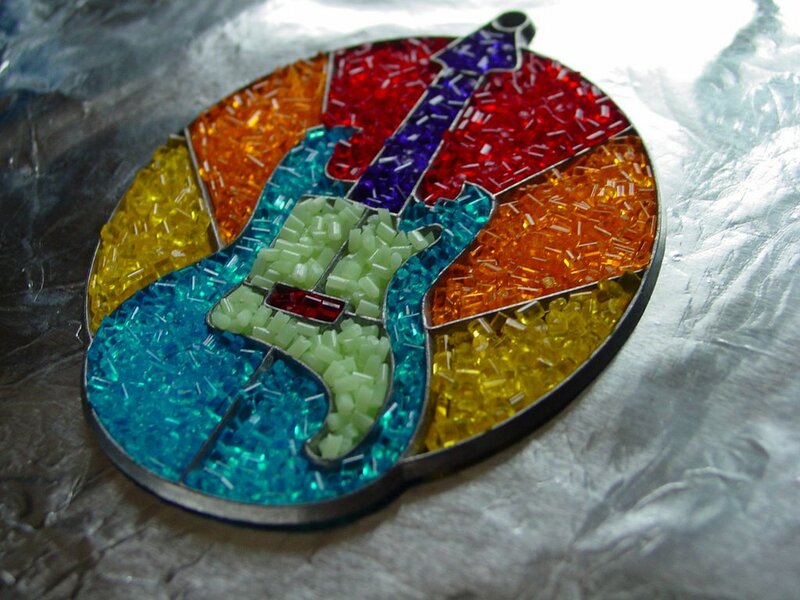 Baking suncatchers was new to me, too. I didn't want that stuff in my precious oven! It's a lot of fu, though. We had some gaps near the edges of the frame because we weren't sure just how many beads were needed in each section of the frame. The corners are a little tricky as you have to use tweezers to fill them up with the crystals. Next time, we'll do a better job! I don't know when that will be as I am praying for school to begin ASAP! Shammi, they're so much fun to make! Actually I think I had more fun than Medha did! I picked up a Makit & Bakit Glowing Suncatchers kit in the crafts section of Wal-mart. It had two frames and 6-7 small pouches of baking crystals. As for the recipe, a precious young child with good fine motor skills is an essential ingredient! Ashwini, tell me, is cheek pinching an Indian thing? I don't see anyone pinching kids' cheeks around here. It's a very doting-maushi-kind-of-thing to do, if that makes any sense! This is too cool! I love finding kid recipes for Soeris lunchbox and this is magic! thanx! Both of you did well, dear mother & daughter !!! I never knew about these makeit bakeit SCs, do you think i am too old to try those ones out ? Ha.. Ha... i am not going to tell you my age though !!! Garlic chutney looks so bright and red !! indianadoc, yup! It's quick and it pleased both Medha and her father! Meeta, it's great to have you here! I love all your entries for Still Life With...gorgeous! I hope Seoren likes these. You can use other spreads to add both different tastes and flavors. Let me know if you come up with any great combinations! Archana, I do try but I am quite challenged in the creative department. You will know what I mean when in an upcoming post! Too old for suncatchers? No way! I had a ton of fun doing these. They did take longer to bake than the 10-20 minutes though. If you are spiritual and/or like angels and inspirational suncatchers, they have frames for those, too. Try it out! And, sorry to disappoint, but that's the kid's platter so the red is ketchup. Although my garlic chutney is very red, too! I use whole dried Kashmiri chillis, maybe that's why! Sounds cool! I will be looking for this during my next Walmart visit. We had lots of fun with perler beads during the last year vacation.